With a background of 30 years composite panel manufacturing experience, ModularWalls is the leading producer of cost-effective acoustic boundary walls and fences. Our products are Australian designed and manufactured to strict international quality standards. With three decade of proven performance, ModularWalls products are applied in a wide variety of industries and government departments. ModularWalls has now provided over 15,000 successful projects, for both residential and commercial partners across Australia, New Zealand, USA and Europe. Our product range includes external boundary walls, retaining walls, impact resistant roadside barriers, and high-tech sound absorbing wall panels for both internal and external acoustic requirements. Our walls offer a genuine alternate to a free-standing masonry wall, setting benchmarks in sound attenuation that benefit the greater community. Built on the foundations of good design, exceptional quality, efficient manufacturing and excellent customer service, our business prides itself on being an Australian manufacturing success story. ModularWalls has proven to be an integral asset to our partners. Some of our Commercial and Civil clients include: BHP Billiton, Rio Tinto, Coles, Woolworths, McDonalds, KFC, Hungry Jacks, Bunnings, 7 Eleven, Aldi, Peet Group, Laing O’Rourke, Mirvac, Lend Lease, Sekisui House, Leighton Holdings, Energy Australia, RMS NSW, Main Roads WA, Main Roads QLD, AGL, Xstrata, Telstra, Origin Energy, and LWP Property Group. In 2003, company CEO and founder Nick Holden combined the well-known attributes of sandwich panel construction (lightness and strength) with a free-standing wall system and the Modular Wall was born. The company has since supplied over 17,000 walls across Australia, New Zealand and Europe. Following a successful family history in composite panel manufacturing since 1987, ModularWalls founder Nick Holden created the first free standing masonry alternate modular wall in 2003. Originally known as Garden Wall Systems, the brand quickly established a niche market and developed an extensive national trade distribution network. Following significant domestic growth, the company underwent a rebranding in 2006 to become Modular Wall Systems, and following our latest rebranding, we are now known as ModularWalls. 2007 marked the beginning of international export opportunities for ModularWalls, as well as the development of BarrierWall, a commercial noise barrier manufactured for the Sydney Desalination Plant. The physical requirements of producing these large-scale barrier walls saw the company again need to expand its operations, moving into a larger manufacturing facility in Southern Sydney. Product innovation into the areas of lighting integration, modular gates and specialty in-house capping continued. In 2010 ModularWalls successfully won a number of large Infrastructure, Mining and Commercial projects, forming partnerships with many large corporations who are now repeat customers. The following year ModularWalls achieved ISO 9001 accreditation and successfully won a large multi-year commercial project for APLNG (Flare Wall contract for Origin Energy) developing the ThermaMax Panel. During 2012, the company expanded its presence in the residential market, developing the SlimWall product in response to a growing demand for premium fencing. The company won multiple awards, including Manufacturer’s Monthly Steel Product of the Year Award, finalist in the Consumer Product of the Year Award for Slimwall, and finalist in the Innovation of the Year Award for ThermaMax. The overall success culminated in ModularWalls receiving runner up at the Australian Manufacturer of the Year Awards. Over the past 5 years, the company has broadened its product range and developed further in-house capabilities to manufacture additional high-tech acoustic and impact resistant panel solutions. Continual innovation in product development has lead to the launch of AcoustiSorb, EnduroMax, TerraFirm and MicraLine in recent years. We have also obtained Cyclonic Wind Rating approval, exceeding requirements for some of the harshest environments in the world. Today, ModularWalls has completed in excess of 17,000 projects, continues to improve and expand its product range, and has a long history of superior customer service and innovative product development. ModularWalls business model centres around the design, manufacture and installation of a range of innovative products including modular walls and fencing, retaining and acoustic sound barrier solutions for a broad range of customers. Unlike many other manufacturers, ModularWalls has developed an integrated supply chain – from the initial design and product development stage right through to installation where required. The design stage is undertaken by our highly qualified design engineers, often in collaboration with some of Australia’s largest companies and government departments to solve their often complex requirements. ModularWalls has developed a range of world leading barrier products with a combination of impressive strength to weight ratios plus acoustic sound absorption properties that separates our business from other domestic and international peers. 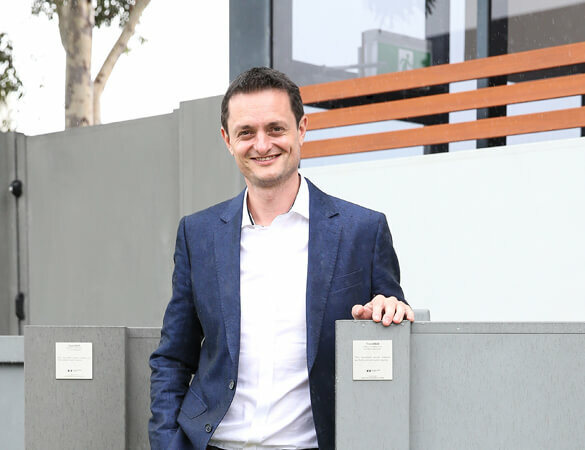 Product innovation and design is core to our business culture, with the business founder and CEO (Nick Holden) being acknowledged as one of Australia’s leading inventors of industrial technology. The manufacturing stage is all undertaken in-house at our modern production facility in Sydney. ModularWalls partnered with AusIndustry to design and build a highly efficient new manufacturing plant to ensure that Australian manufacturing can continue to exist and succeed in a competitive global manufacturing environment. Most of the machinery within our manufacturing plant has been custom built in-house which has enabled ModularWalls to create a range of high quality and custom designed products that are significantly superior to our competitors. The final stage of the supply chain involves full installation onsite to customer specifications. ModularWalls is proud of its ‘easy to install’ products which have also been designed to be installed by enthusiastic DIY customers on the residential side. Our commitment to innovation across manufacturing of composite panel technology and metal laminates underpins our quest to continue to be market leaders and innovators. Our new Head Office and manufacturing plant in Southern Sydney is a direct result of our exceptional growth. We are excited about the possibilities each new project and customer brings. From the manufacturing warehouse to the boardroom we offer opportunities as diverse as manufacturing, engineering, IT specialist, marketing, sales, logistics and finance. We harness the talent of our people and ensure they understand how they contribute to the wider success. Our performance and development strategy is designed to bring employee aspirations to fruition, which translates into clear accountability for each employee. Through training and solid induction programmes, we assist our employees when moving into new roles, encourage the development of professional skills and provide specialist training where needed. Born in 2003, ModularWalls has now provided over 17,000 successful projects, for both residential and commercial partners. ModularWalls' products have been rigorously tested and are used on a federal level in Australia by both Queensland and New South Wales states. ModularWalls is an Australian manufacturer with a strong emphasis on continuous innovation and high quality standards for its products.